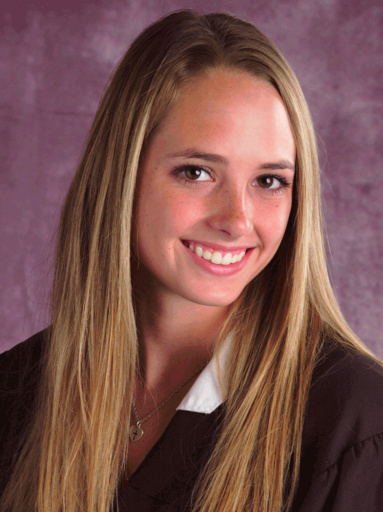 Kelsey Vines was a senior at Lubbock-Cooper High School. She and her twin, Kayla, were both captains on the basketball team and looking forward to their senior year. On September 2, 2008, after shooting baskets after school, a 40,000 lb. dump truck veered into their lane and struck their vehicle. Kelsey was driving and was killed instantly. Kelsey was a genuine Christian and was famous for putting a smile on people’s faces, whether they were close friends, relatives or people she had just met. It was not just talk with her and she lived her life much like the proverbial child Christ talked about. She often quoted Biblical scripture, but never in a sanctimonious way. She did it to show how the words were a part of her life. She did it to reinforce the way she treated all people with love and grace. And she did it because she loved life and the lives surrounding her. After her death, the Kelsey Vines Memorial Scholarship was established to award $2,000 to two Lubbock-Cooper seniors. So far, this scholarship has helped more than fifteen students as they continue their educations and it’s been a wonderful way to keep her memory alive. The Kelsey Vines Memorial Scholarship is maintained by the Lubbock Cooper Education Foundation. For more information or to apply, please contact the Lubbock-Cooper High School counselor.